Illinois legislative leaders haven’t decided on their next move following a report that offered options for improving the finances of Exelon’s nuclear power plants. All of the options are likely to result in higher power prices for consumers. Brown said the recent turnover in the state’s executive branch will play a part in what happens next. Republican Gov. Bruce Rauner took office last week, replacing Democrat Pat Quinn. “I’d say later rather than sooner regarding the timetable,” Brown said, adding that it was premature to say which of the five options will gain traction. Likewise, the office of House Republican Leader Jim Durkin, who co-sponsored the resolution, offered no timetable for a response to the report. 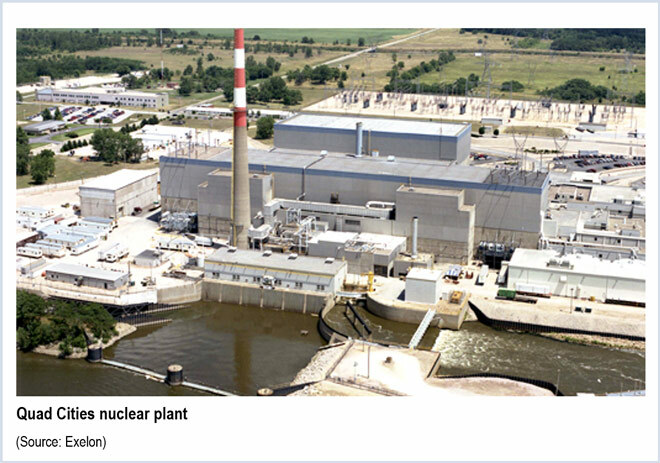 Exelon has said that its nuclear generating stations in Byron, Clinton and Quad Cities are unprofitable in the current market and that government subsidies and tax credits afforded the wind and renewable energy sectors have created an unfair market advantage for its competitors. The nuclear power giant argues that its stations should get credit for producing carbon-free electricity. While Exelon lauded the report as validating its view, others interpreted it differently. “These reports clearly demonstrate that the economic situation for multiple nuclear facilities is much more manageable than originally thought. The report also finds that the retirements of the Illinois nuclear fleet will not cause reliability problems with the state’s electric supply, except under extreme scenarios never before seen in U.S. energy markets, including PJM,” said David Gaier, spokesman for NRG Energy. Gaier said the best course of action would be to keep the status quo. “Allowing the market to work, which means no ‘subsidy legislation,’ will save ratepayers more than $120 million per year,” he said. Much of the Illinois report addresses the potential costs to the state if the plants are retired, which would result in the loss of jobs and tax revenue and the possibility of having to burn more fossil fuels to replace the lost generation. It was produced by the Illinois Commerce Commission, the Illinois Power Agency, the Illinois Environmental Protection Agency and the Illinois Department of Commerce and Economic Opportunity. Exelon’s year-long lobbying campaign has won bipartisan backing for a bill that would charge Illinois electricity users a fee to ensure continued operation of three nuclear generators that the company says are unprofitable. Lobbyists from Exelon have descended on Illinois lawmakers, warning that current energy prices and what renewable energy subsidies could force them to shut down three nuclear stations in the state.